First things first. If you are solo Indian traveller to Bhutan, please bear in mind that tourism in Bhutan is designed for group travels, and you would need to be fairly ingenious to keep it within budget, in case you plan to do it alone (and on a shoe-string budget). If travelling in group is an option for you, then remember, four is the magic number. Local taxis, hotel-rooms, food, travel between cities, everything works out cheaper if there are four of you. From the fifth person onward, you need another taxi everywhere. No if(s) and but(s) here. With this, the whole budget-math goes for a toss. Bhutan: Bhutan has two parts. The touristy Thimphu Bhutan, and the non-touristy Samdrup Jongkhar Bhutan. At places, you might be expected to clarify which of the two you intended to visit. Is Bhutan safe? Very. You could be single, slightly tipsy girl, loafing around on the dead streets of Paro at 11pm, and no one would bat an eyelid. We have a lot to learn from this pea-sized nation in that respect. “Solo traveller”: Travellers from no other country except for India, Bangladesh and Maldives can travel to Bhutan ‘solo’ in true sense of the word. Why? Because if a traveller does not belong to any of the three aforementioned countries, he or she has to hire a guide from Bhutan and follow a pre-planned itinerary, with a compulsory daily expenditure of $250. No solo, open-ended loafing around within Bhutan, unless you are invited by a local organization for assignment. Also, if you’ve heard that solo travellers are not permitted in Bhutan, here is the clarification on it: Solo male travelers from India are not allowed (though I know quite a few who have been to Bhutan by themselves). Bhutan has no problem, what-so-ever, with solo female travellers from India. The only thing the officials try to assess is, if the lady/girl in question would be able to keep herself safe. 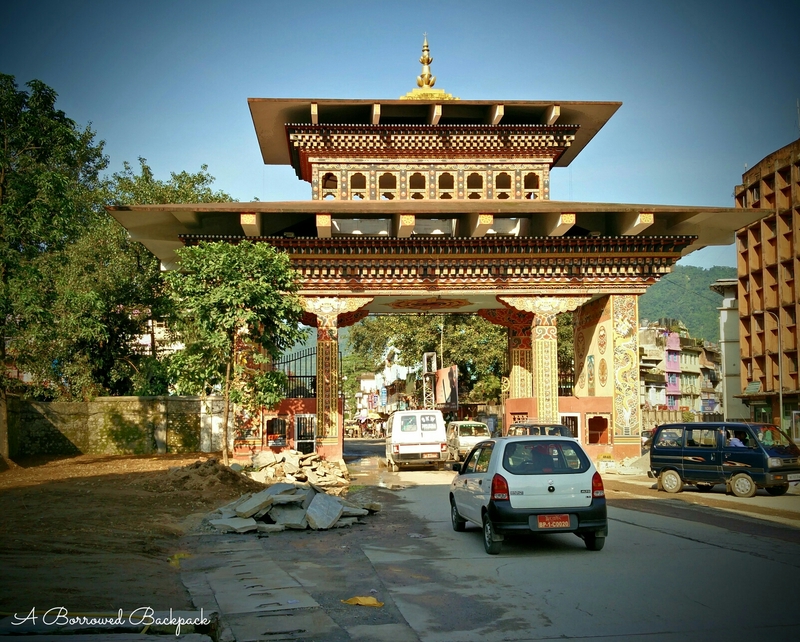 Bhutan Entry-permit Offices for Indians: How-so-ever you plan to go, please remember that absolutely no fee is charged by Royal Government of Bhutan for issuing the permit. Let no one con you stating otherwise. a) By air: You can take Druk Airways flight for Paro (the ONLY international airport Bhutan has, is in Paro) from Delhi, Gaya, Mumbai, Guwahati, Kolkata and Bagdogra (Siliguri). NO OTHER airline lands in Bhutan. Why? Because Paro airport is world’s one of the top ten toughest airports to land a flight on. You MUST take up this experience, in case you can afford and love adventure, now that you know. I did not know of this precious fact when I was planning my trip. You can apply for permit on arrival, or from Consulate in Kolkata. b) Over lands: At the Phuentsholing office, permits are issued for Paro and Thimphu. Anything beyond that (Haa valley, Punakha, Samdrup Jongkhar Bhutan etc) will need permit from Thimphu office. 1) In India, it is in Kolkata. The permit is issued by the office of Royal Bhutan Consulate. The office operates from 9:00am-5:00pm, but the documents are accepted till 12:00 noon. 2) In Bhutan, on Indo-Bhutan border: First things first, if you are looking to enter Bhutan over-lands, try to reach the permit office at Phuentsholling at 9:00am. To roam around in Phuentsholing, you do not need any permit for the first 5kilometers from the entry-point. The office is roughly at a distance of 200mtrs from the main gate, on the right hand side (please keep the half-an-hour time difference in mind when you plan your day; Bhutan is ahead of India by half-an-hour). The Border: India and Bhutan are divided by a friendly and permeable border. Phuentsholling is the Bhutan side of the border-town, while Jaigaon is the Indian side. The stark difference in both the towns makes it worth the experience. What are the documents needed for Bhutan? 1) You are handed out a form to fill with your details, and some information about your intended travel plans. 2) The form has a column where you will be asked to state which are the hotels where you intend to be staying at during the course of your trip. Since I had not planned my stay-option in Paro and had a host in Thimphu, I had left it blank. The official accepting the form suggested that I write ‘any hotel‘ instead of leaving it blank. 3) After going through my form, and figuring out that I am going to be on my own, the officer in question pondered over my form great deal. He had another official sitting with him, who observed me while I answered questions by main officer. Key-tip? Whatever they ask, answer with honesty. You might be doing this five times in a year, but they do it for their living, and day in and day out. Fibbing will only delay the process, or, you might be denied entry too. Pro-tip: Try and be the first one they deal with when they begin their day. This way, you are less likely to bear the brunt for someone else’s mistakes. 5) After your form is stamped, you are asked to go to another room, where they electronically take your photograph and thumb/finger-impressions. After which, you are requested to wait for ten minutes. 6) Ten minutes later, you are handed a permit with all your details and terms and conditions for the trip, on a single piece of paper. You have to go back to the main official (mentioned in point no 3), and get it signed. I entered the permit office at 9:00am and was out of it by 9:35am. It is a very breezy process. Permit: Keep this permit with you at all times; it is valid for 7 days. You would not need it within city-limits, but inter-city, you will have to get down at several check-posts and get this stamped. Pack it in your day-pack, instead of the main luggage. On the last day, on your way back, you will be expected to surrender this permit at the last checkpost in your trip (in my case, it was before entering Phuentsholing). Telecommunication: Switch off your Indian phone as soon as you step on the Bhutan side of the gate. It costs exorbitant international roaming rates (Rs.70/min) to say “hello baby, guess where am I?? !” to your Significant Other back home. Be wiser, take Tashi sim card once you get through the permit process. Getting a Tashi sim card is very easy and works out really inexpensive; costs about Rs.100 for the sim card, and an additional Rs.100 for recharge. (call charges to India: Rs.5/min). Documents needed for Tashi sim card: A photograph, a copy of your passport/voter-id card. It takes less than 15 mins and you have a local number, which comes very handy (giving it to taxi drivers, co-ordinating with your hotel). Stay: In case you have to spend the night at the border, my advice would be that you stay on the Bhutan side of the border. It is relatively cleaner and safer, but it is slightly expensive as compared to Jaigaon, which has very limited options. On my way back, I stayed at Hotel Sinchula; it is basic, safe and clean. Hotel Druk is another option, with plethora of other hotels in the area. Currency: While India has Rupee, Bhutan has Ngultrum. Both the border towns, Phuentsholing and Jaigaon, accept both the currencies and both are pegged equal to each other. I ended up buying Bhutanese liquor for the amount, instead of losing money in exchange. About The Border-Towns And Entry-Exit: Overlands, entry is possible only from Phuentsholing-Jaigaon border. However, you can exit Bhutan from Samdrup Jongkhar Bhutan border (you cannot enter from the latter though). No Smoking: Not more than 200 cigarettes can be carried to the country. It is illegal to sell/buy cigarette in Bhutan, but you can smoke some, thanks to the ‘the curious case of buddhism’. Travel & Hitchhiking: Bhutan is one of the best countries to share rides and hitchhike, in case you know how to do it. I shared my ride to almost everywhere, thereby keeping myself within budget. ATM and Cash withdrawal: India side of the border has quite a few ATMs and I suggest that you withdraw the money you need from the Indian side itself. Inform your bank about your ‘international’ trip, and that you will be using your account from foreign locations. Check with your bank if your ATM debit/credit card would work in Bhutan. Self-drive: You can drive your Indian vehicle with your Indian driving-licence, the permit for which is easily obtainable in Phuentsholing, against all the documents pertaining to the vehicle. Please bear in mind, you can NOT drive a Bhutanese vehicle with the Indian driving licence. You might also want to start practicing honking-less driving, as in my seven days of stay in Bhutan, I heard only one vehicle honking in Paro. Validity of Permit: Phuentsholing office issues permit for 7 days, for Thimphu and Paro. In case you wish to extend your permit time-wise (more than 7 days), or geographically (add more places), both can be done from permit office at Norzim Lam, in Thimphu. a) if you have to remove your footwear to enter a place, it is safe to assume that photography is not permitted. There might be a few exceptions here and there, but it better to be on the right side of the cultural practice than err and be sorry a pest. b) Take permission before you click anyone. c) Do NOT click the members of the royal family. Happy travels to the ‘land of thunder dragons’! Tip: In case you have Tiger’s Nest, or Taktsang Monastery in your itinerary, you must read this post. As per a latest update from Jaigaon- Phuentsholling border, the office issues permits from Monday -Friday only. Entry permit office, remains closed over the weekends now. Please plan your trip accordingly. It is suggested that Mondays are to be avoided because of excessive rush. As per the latest rule, you MUST have a hotel reservation to obtain an entry permit. From 1st January 2019, it will be mandatory for Indians to carry either their voter id card, or the passport to be able to enter Bhutan. Here is the link verifying this information. Bhutan govt will no longer issue identification certificate in case you don’t have the relevant papers. Also, minors need original birth certificate for issuance of a permit. In case you are not sure of your stay, book a hotel through Booking.com. When you reach the destination, and find a better deal, you can cancel like I have done a few times. The site does not charge any cancellation fee. Looks at the other officer sitting next to him, then stares at the form long and hard. Dead, horrid silence for 30 seconds where we all are looking at each other in disbelief. Signs immediately, but looks on with fatherly concern as I leave his office. It is a kind of look that I am not going to forget for a long, long time to come. What Should Solo Indian Traveller Be Mindful Of? Safe for everyone; families, solo woman and solo man. but like u have mentioned, i have read travelogues of guys wo have traveled to Bhutan solo! Never did i come across the “no-solo-indian-male” stuff!!!! just curious! There is this directive issued by the consulate in September 2014, apparently; can;t seem to find it on the web. I had confirmed this from Bhutanese friends before planning my trip, and have mentioned this precisely for the same reason you have stated; that no other travelogue has mentioned anything about this. ah! okay! thanks for posting that information!! might be of use some day!!! cheers! Im sitting here in a hotel in Jaigaon, alone and reading this. This is horrible! I don’t know what to do! I am so sorry if that is the case. Have you been denied the permit? Or did you chance upon the article before trying even? Please give it a shot before you decide to turn back. Did you made it solo into Bhutan? Was it a successful trip? Loved the detailed write up. I was perplexed on reading in many blogs that solo Indian ladies are discouraged in Bhutan. I am planning to book my stay at hotel in Thimpu and fly from Bangalore. The travel arrangements will be organised by me on arrival. Do you think i will face questions like you at the immigration desk in Paro? Have you heard such instances? Alternatively, i see make my trip has organised trips…i am not keen on that. Please go ahead, Shilpa. If they ask, just convince them that you will be safe, and will not go out looking for trouble. Love reading this, your tips and comments are great. I have not travelled alone before and going to do so for the first time this year – trekking in Armenia. Scared but excited, keep on sharing please. How wonderfully written, well explained, love the way you included every minute details here. Thank you so much. Very kind of you to say that, Joy bro! Shukriya ji. Awesome blog, I will be travelling to bhutan in March, Can you please suggest some budget hotes/guest house in Paro and thimphu? say under 1500rs per day. Sure! You have a fancy budget; you will get accommodation easily. If you still want me to suggest, please shoot an email at raidivya@hotmail.com ; will check and let you know. Want to know what all bookings should me made in advance. I think March is the tourist season, so will it be easy to get hotel rooms on arrival? I made no prior bookings, and took each day as it came. You can, if it helps you sleeps better. Make your hotel reservations to be on the safer side, if you wish. Do not worry one bit, just tell them you travel alone a lot. They have no problem with single women-travellers. Don’t litter your plans with doubts. Have faith, and take off. That is what I do. I am planning a trip to Bhutan towards the end of march. To be precise, I shall start on 25th March and finish by 1st April,2016. I have a fee questions I hope you can answer. These are eating me from the within. 1. I shall reach Jaigaon on 25th March, 2016 by 16:00 hrs – 17:00 hrs. Will I be able to get my travel permit papers starting from 26th March, 2016 on 25th itself??? Or should I wait for 26th March, 2016??? The second part of the question is that 26th March,2016 shall be Fourth Saturday. Like India, shall Government Offices of Bhutan too shall be closed on that day??? If yes, then I have to wait another two days for my travel permit. If this be the case, then I am practically done for!!! I would better return back. So help regarding this matter. 2. Any idea of travel options from New Alipur Duar Station to Jaigaon??? I mean Bus/Cab/Shared Taxi/Auto etc. Also, if you can provide, it would be helpful if you give me the bus timings or cab/taxi fares from New Alipur Duar to Jaigaon. 3. It would be helpful if you can give me details of Sharing Cab/Taxi for hire for the trip. 1) You will get your travel permit papers from 26th, and on 26th. No. The remote office in Jaigaon is open as far as I know. 2) You can take a bus from Alipur Duar to Jaigaon. Charges are nominal. Some Rs.70. There are Taxi plying on the route, but I don’t know the charges. Buses go frequently during the work-hours. 3) Bhutan has shared taxi to and from Phoentsholing. Between two towns, other than Phoentsholing, you either use coaster bus, or hire a full taxi. I shared the taxi with another couple by requesting them for it. Dig around, and you will find. 1. Is the thimpu immigration/permit office open on saturdays and sundays ? 2.Is permit given for Phobjikha ? 1.I can tell that Thimphu permit office is closed for the weekend, for sure. I am not sure about the timings for Friday. 2. Which part of Bhutan does Phobjikha come under? 1) in Thimphu the immigration permit office is closed on weekends. 3) I had a host in Thimphu. For Paro, I stayed in a hotel on the main Street. The name, unfortunately, escapes me. Hi borrowed backpack, thanks a tonne for the guide but a few questions linger in my mind. 1. if i am able to get done my permits and stuffs from the consulate at kolkata itself, should i have to face more of the likes in Bhutan too, to travel to different places in the Himalayan kingdom? 2. you said male solo travellers are not allowed. but i am planning to reach thimpu all alone. so? anyway, i have a host in thimpu. so till then, should i be concerned about the authorities for travelling alone? 3. where should i exchange my INRs with Nus? in phuentsholling itself? 4. i am about to stay in some corporate guest house in thimpu. apart from that i have nearly fixed the budget to 10,000 bucks for three-four days of my sojourn. is this amount sufficient or i should loosen my wallet a bit more? 1) As far as I know, remote offices can issue permits only for Thimphu and Paro. For everywhere else, you will have to apply the office in Thimphu. 4) this amount is more than enough as long as you would be travelling in shared cabs and keep your expenses low, generally. If luxury is your way, then your budget is low. Hi, Borrowed Backpack Hope u r doing fine. 1. What are the timings of Immigration office at Norzin Lam Thimphu? 2. How much time does it take to get special permission Immigration office at Norzin Lam Thimphu, say if the process starts at 9am? 1. Starts at 9:00am is all I know. 2. Not possible to acertain that. Ought to take an hour or so. Nice article. I went there again a few months ago. Self-Ride as always. Just wanted to point out two things. They stopped accepting Driving License as Indentification document for the permit. Only Passport or Voter’s ID. So far as I know. Luckily I had passport with me. 2. No overtaking through the left. 3. Keep to the speed assigned. 4. If a vehicle puts the left indicator on a straight road, it means he/she is allowing you to overtake. If right indicator is on, means not to overtake, vehicle approaching. 5. Keep the tank full, u never know when u will get another petrol station. It is advisable to fill the tank in Bhutan. Petrol is cheaper by Rs 10. 1) They do accept DL, but that is totally the officer’s discretion, which is why I have mentioned it in the order of preference. 2) SBI ATM card will NOT work.in Bhutan. I am SURE of it. Confirmed it after coming back to India too. Read the fine print behind the card. Thank you for the tips for riders. This should be handy for a lot of people. I will add this bit as an edit tot he post, with credits to you. But I travelled with a single SBI card. I did face issue regarding the same in Thimphu. The hotel wasnt accepting my card. N the nearby ATMs (all 3 of them) were showing transaction failed. Then I had to ride into the city to find another ATM, which was Bank of Bhutan and voila it worked. I didnt knew of this cuz i withdrew money in P/ling & Paro through Bank of Bhutan ATMs. During my travel I used my SBI card 6 times in ATMs and it only worked with Bank of Bhutan only. But in any case, its better to have a backup account. 2) take chance/ plan accordingly. I was so taken by surprise at non-withdrawal of cash, that I called the SBI helpline and they told me to read the finer print on the back side of my ATM card. It COULD be also dependent on the kind of account one has, but I am not sure. Rarely does anyone post a comment just to say ‘thank you’. You are a wonderful exception. I am planning a trip to Bhutan in June end-July start (7-8 days) with my friends. As far as I know, June-July is the monsoon season so could you let me know whether this is a good time to visit Bhutan or not ? If yes, what are the possible problems, being monsoon season, which we could face and also the must visit places? Whether using a travel agent is a good option to plan the itinerary or we should plan on our own? As a traveller, one perspective that I have is there is no wrong season to visit a place, unless it threatens life and/or ecology of the place. Bhutan is known to be ‘land of Thunder Dragons’, but I don’t know how many tourists have seen that aspect to it, all because they want to travel to the country during the ‘right season’. In June and July, you MIGHT get to experience the very feature the nation is known for, apart from getting rooms etc at lower prices. So, just go! 1) keep extra days at hand. 2) be careful when you take up treks. 3) check sites like AccuWeather to plan your days. Plan it on your own, and I will explain you why. I travelled to Bhutan for 7 days in ₹7k, while my friends who went with tour operators paid 22k for the same or lesser experiential things. Why would you want to pay extra so much? Please keep checking the blog. Posts on Thimphu and Paro are on their way. Should be up by end of the month. Hi Divya! It’s an amazing write up and super useful considering I’m planning a trip from Mumbai in Aug. I totally agree that self planned travel is way better than going through agents. Could you share your detailed itinerary? I’m traveling solo (for the first time) and super excited to select Bhutan as the destination. Thanks! You can do it like this- Paro 2 days & Thimphu 2 days. You might want to add Punakha (1) and a few other places. Good to go through your experience in Bhutan. I am planning a trip in June 2016 with wife and 8 months baby. My plan is to catch a cab from Bagdogra airport to Phuentsholing, stay there for a night and take cab for Paro next day morning. Approx ₹2000 for cab from Bagdogra to Phuentsholing. Approx ₹2200-2500 for cab from Phuentsholing to Paro. Both are easy to get. I am planning a solo (male) birthday trip for 5 days in July 1st week (July 2 – July 6). 2. How expensive is it gong to be because I will be a solo male vegetarian traveler? 3. Are there additional processes I should/ would go through? Have you considered Pondicherry, Kochi, Mangalore (if near by) or Rajasthan, Kutch, Konkan railway stretch of far off. Expense is an individual factor. All these places can be done at shoestring budget. Done them all. But Rajasthan, yes, I’m considering though not in July for it’s weather. Been wanting to visit Bhutan but got no company. ‘Company’?? Isn’t your query for solo-tripping? Hello, How are you. This is a great blog that you have penned. So me and my friend are planning to travel to Bhutan on 2nd week of June. Our itinerary was to to visit Paro then trek to Thimphu via DRUK PATH TREK and then to Punakha. I love to plan my treks and do them on my own. I have some experience is trekking. Can we trek without a guide. Also are there any accommodation options during trek (I’ve my own tent and bag, can i pitch it). Also how are accommodation options in Paro, Thimphu and Punakha . What is normal cost of hotel room in these places. Waiting for your blogs on Paro and Thimphu. In Bhutan, you can trek without a guide. People are very friendly. I don’t know how much of pitching-the-tents is allowed, you will have to check. Moreover it might rain, so please be prepared. Paro and Thimphu have budget hotels; I don’t know about Punakha. You should get a room at 400/day. Penning the next ones down; soon enough. I am planning a trip next month from 10 june to 19 june for bhumthang and trashigang. Their is going to be a festivals their during this time. And as a travel photographer I whish to capture that. So my question is it’s possible to travel solo from thimpu to bhumthang and what about transport facility to bhumthang? I have no clue about travelling to Bumthang. Didn’t go. Sorry, won’t be able to help. Hi Divya, Awesome Travelogue 🙂 This is best I have read on Bhutan so far. Thanks a ton. I was planning a solo trip but reading your blog realised its not permitted – is there a way around? Do they have embassy in Delhi where they issue permits to Thimpu?. If not solo – will they allow two male Indian travellers ? Two male Indian travellers is not a problem, but please remember, I have written that I am aware of quite a few male travellers who have travelled to Bhutan solo. I don’t think that the embassy in Delhi issues permit, but you can check, maybe? Call and ask? Haha! That was a good answer. Thank you for getting back so quickly. Lot of info on your blog, I don’t know where to start. Keep up the good work. Looking forward for more. Fabulous tips! Came here from The Himalayan club. Great tips. Very very well listed down. Was in Bhutan 2 months ago. It is such a gorgeous place! ???? Can relate to all of it. Very useful and detailed. Hi Divya, I am planning a solo trip to Bhutan (from Singapore). Just came across your blog post and I must say it’s very useful!! I’ll have to find the relevant offices etc here. This is the first time I will be traveling solo! So, yes, I am quite nervous about it! How many days would you suggest and would you be able to advise a Budget I could work on? Any recommended itinerary / places to stay etc? I’m thinking of traveling mid August. I think 8-10 days are decent if you are not a slow traveller. The budget depends on what kind of traveller one is; it is a very subjective question. Mid-august might be rainy, but give it a shot. Hi .. great post .. are you sure solo male Indians are not allowed ?? Seems bit discriminatory …. Also suppose if I try to enter through border, is anybody going to stop me ? Will permit office not give me permit to stay for 7 days ? I hope you have read the post carefully. I have stated that I know quite a few male travellers. I am no final authority on what the officials would respond if you are a male solo traveller. Please try your luck. Thanks for the in depth info. Would you possibly know if the Bhutanese are tolerant towards other religions especially Islam. Being a solo indian Muslim female traveller ,you reckon I’d face any issues entering Bhutan? Bhutan is VERY tolerant towards all the religions. My hostess in Paro was a lovely girl of Islamic origin, hailing from Pakistan. She said, she loves living in Bhutan, so I am assuming it is all good. Thanks so much for your response. Would you also know which would be a better option accommodation-wise- Hotels or home stays. While Thimpu and Paro have abundant options, I haven’t seen many budget friendly options in other cities. Would you know by any chance? I travelled to Thimphu and Paro only, so no recommendations for other cities, unfortunately. Will i get a permit from Kolkata Bhutan House as a solo travellor? No clue. If you do, please update us too. i need to find out about the solo male traveller thing. whom/ where do i call ? I don’t have any such update/information. Sorry, can’t be of help. A very detailed and well written account of your travel.. a little disappointing that solo male travelers are not allowed since i am planning a trip in September.. nevertheless.. the place is still on my bucket list.. I thought it came across clearly that I do know some male travelers who have been to Bhutan solo, so you can try. For entry permits one needs to carry photocopies of your Passport/Election ID, itinerary, and booking reservations for your entire stay. I have penned down my detailed Itinerary, which includes costs and tidbit opinions. Hopefully it’ll help someone out. •	Walk from the hotel to Memorial Chorten (It had an entry fee, didn’t go in. Just took photos from outside). •	From there, walk to Folk Heritage Museum (Rs 50 entry fee), have set lunch for Rs 300. •	Cab to Ta Dzong museum (Rs 50), Nya-mey Zam Bridge (a cute wooden bridge over Pa Chhu, leading to the district administration HQ fort), and Archery range in Paro. •	Crossed over to Jaigaon at 7.15 am. •	Reach SIliguri at 12.15 pm. •	Reached Airport by 12.45pm for a 4.30 pm flight, but the airport was filled to capacity (trains to North Bengal and Assam are currently cancelled because of floods in Bihar), so we didn’t feel like we were too early. Hope you have the most chilled trip! PS- did you like Malaai Chaap? I found it to be overrated. Is hotel booking upfront necessary before getting the permit to bhutan. Nice one. And the best part it is updated one. Thanks to both Divya Rai and Ruha. Am planning mine Nov 2018. Your first is answered in the blogpost. No clue for the second one. 4. Read your latest edit(2), but I am not sure of our accommodation plans yet. What is the best way to go about it then? 1. No, they do not close intake at lunchtime. 2. That’s tough. Try though. 3. No. Monday is the only option after that. Or try applying in Kolkata, I guess. 4.There is no way around this rule. I am an Indian citizen from Easternmost Assam and ardent motorbike traveller who loves to travel alone. I have done no. of solo ridings in the past in India and Nepal. I was planning to travel Bhutan this November in my motorcycle from Assam India via Phuentsholling. I was collecting information and getting tips from earlier tourists since 2-3 months. But your information that solo travellers are not allowed in Bhutan is really heartbreaking. I am in great dilemma due to this information and don’t know what to do? Can u pls tell me the official website of Bhutan govt. where i can ask them whether they have special conditions for solo male entrants. As u have mentioned that some people from India did solo tour in past there is a glimmer of hope for me. But I want to be absolutely clear about it before moving ahead. I know enough solo male travellers to Bhutan, so please go! It is a really beautiful blog. Thanks to you and Ruha also for all the information you have put. I have booked my tickets from 23rd to 30th Dec. I am travelling Solo and may find someone to share and travel at Phuentsholing. My mail ID is sri.tss@gmail.com. Please let me know if some wants to be apart. If I don’t get a travel companion then I will follow Ruha’s itinerary. Can I cover Phunaka, dropping some portion from Thimpu?? Thank you for your kind words (I wish I knew who Ruha is though). I think social media is a better place to look for a travel companion. Yes, you can drop some portions from Thimphu to cover Punakha. Great narrative & very informative, enjoyed your quips too :0) . I am planning to visit Bhutan next month, the only difficulty I am facing is in finding a cheap place to stay, checked some of the hotels online and they are exorbitant, any suggestions for affordable stays and how to get them booked will be very much appreciated. My travel days are from 21 Dec – 2 Jan, so not sure if we will be able to align our trip, moreover I will be flying in to Paro airport. One observation, 23rd Dec is a sat, so you will only be able to apply for your permit on 25th Dec Monday. I think what you COULD do is, book through Booking.com and then cancel if you find a cheaper option there. This way, you will have a roof over your head in case nothing works out and you can get in too. I heard solo backpackers have many issues while entry and stay in Bhutan…. It also depends on who you are asking. If you are asking arm-chair travellers, then the answer will be that only. Hi thanks for the valuable inputs everyone . I’m a solo male planning to travel on 22nd Dec to 26th Dec. My intention is to go to paro for tiger nest monastery. I want to know for any other monastery I can go for in that brief period. Also I’m carring only aadhar card and pancard in original other documents I have soft copy of passport/voter Id. I am on a road trip to my native in the north east state assam so travelling solo. I don’t know any other monastery or if the time you have at hand is sufficient for the same. Aadhar and Pan Card should suffice. I don’t have passport or election card, can I use my aardhaar card? As far as i know, it would. Very Informative and loved the way you made the entire blog so engaging. Hi Divya, Me and my significant other planning for Bhutan.trip in April 2018. Are there any regulations against unmarried couples entry to Bhutan? I have heard some stories from past experiences of couples not being allowed permit to Bhutan. Please clarify if you have any information. While I do not know what is officially the correct information, I don’t think that would be a problem. Please write tot he authorities and check. Thank you Divya Rai for all the information. It is really going help modify my trip. But I am planning to visit other places in Thimpu and vicinity as well. These articles by you are really helpful for solo travelling. Hi Divya, me and my wife are planning to visit Bhutan on our own bike entering from Phuentsholing. Do you think there would be any problem since it is just the 2 of us? Hey , Thanks for the information. So the thing is I am planning to travel solo from 20th April to 30th April ‘2018. And now I have to keep Plan B ready for north east trip if the permit is not allowed to Bhutan. Guys , please let me know if anyone else is travelling or interested to plan on these dates. So I called up today to Bhutan Embassy to check if there is any problem for Solo Male Travelers. The guy from the embassy said “Kaun bola problem hai , Thappad maro usko ” . 😛 . Koi problem nahi hai “. And he added , Solo travelers with bikes is not allowed and that is the only restriction. I wish you had read the date of the post, AND the updated content carefully. So Solo(male) travellers are fine. I made it solo 21st to 30th April 2018. Just make sure u have your stay booked already. For solo travellers I would recommend Homestays. Easily available. And affrodable. And they might ask for self declaration. Happy people’s country. Just be polite and smile. Totally agree. Thank you for the feedback. It helps others. Hi Divya, your write up on Bhutan is quite informative and thanks for sharing the details. We are 3 riders and plan to do Bangalore to Bhutan in Dec 2018. I wish to know if we can exit Bhutan on a weekend or on a public holiday? Request you to help me with this answer. You can exit Bhutan any time you want. There is no major paperwork involved. You just have to hand over the permit at the checkpost and leave. Very informative and engaging piece on Bhutan travel.Have travelled solo. But first time to Bhutan. The age,75, doesn’t bother me. Rather spurs me to do the thing quickly. First, I shall be at Phuenshling office on 21st June at 12noon. You think it is feasible to get permit and catch 3 PM bus the same day? I am hoping that they will not kill my curiosity by turning me down. Of course I shall try convincing them. Now since I have travelled to places and shall travel even more, give me all that you can so that I can keep within your Bhutan budget. I want to spend 2days in Thimphu and 2 in Paro. And I am not troubled by minor discomforts. And folks anyone reading this and planning at that time, meet me at 12 on21st June in Phoeuntsholing. We could become a group unless you can’t stand a very slim man with reading bifocals,white chin beard and plain white hair.But rest assured, I shall not lag behind you. And of course I am not high society. I am a budget driven man. 1) Yes, it is possible to get the permit the same day if you reach by noon. 2) I do not have stay recommendations for Thimphu as I had a host there. For Other places, I suggest you hitchhike or share cabs etc. That brings down the expenditure drastically. You can also pair up with other solo travellers at the permit office itself. That too can help. At 75, as I am preparing to go solo to Bhutan, I am glad to get into this very lovely, comprehensive and engaging blog of yours. Little wonder everyone is highly appreciative of the write up. Now I am a rather stingy old bloke who has just returned from Sangla and Tabo and in a bit of hurry to get over my Bhutan craze as I have plans lined up for Burma, China, Vietnam and Cambodia. Now unless I watch every penny that leaves my pocket, there’s no way I can translate these plans. And I appreciate your doing the kingdom under Seven. So give me the tips principally on accn – June 21and 22 Thimphu; June 23 and 24 at Paro. I am not a comfort driven man. Of course I would not like to shiver at night. It appears that I shall be at Pheuntsholing window by noon on the 21st. Would it be reasonable to expect the permit the very same day so I can catch the afternoon- 3pm bus? (And dear folks if anyone of you is reading this and planning to visit Bhutan on these dates, remember to see a very slim, chin bearded, white haired, bespectacled man waiting to be part of your group. Don’t worry he will pay for the ride and everything else and keep up with you on treks. Unless of course you dislike old blokes around you. Good luck to you then. Also anyone who wouldn’t mind my joining them at least for permit may please call at 9466192065. Have responded to your other query, which was of the similar nature. Loved the transcript of your permit interview with the Bhutanese officials. Would have had the exact same mind chatter. It’s been a while since I’ve laughed out so loud. Thank you. Producing day-to day content calls for a lot of time and not so worth the effort as different people like to do different things. You can write to me at aborrowedbackpack@gmail.com, with your queries. I will try and answer if I have time. Hi, thank you so much for writing these easy to miss but extremely critical points in this blog. 1. I am reaching Phuentsholing on Friday at 3 pm. When can I expect to get the permit? 2. Do I need to exchange INR for Nu to travel in Bhutan? I think I replied to your email Zenab. Yes, you can carry cigarettes. I think upto 200 or something. I have been to Bhutan as Solo Traveler. For getting permit, along with Immigration Form, Itinerary & Hotel Booking Receipt, you will need to Submit an Undertaking Letter that you are solely responsible for your well being. I loved this article Divya. I was planning Bhutan trip for March end and was wondering If I should go for solo trip or group trip and your blog gave me so many ideas and also confidence in case I need to travel solo. Thanks for all the in details you have provided in the blog. Keep sharing your travelogue. Thanks a lot… im travelling by 10th of march, so was just gathering some info. the post really clarified a lot. u covered most of the travel necessities… might require ur help. thanks for now.